I have had this idea for bleach dying on my Pinterest board for a very long time. I keep wanting to try it but can never decide what kind of design to do. 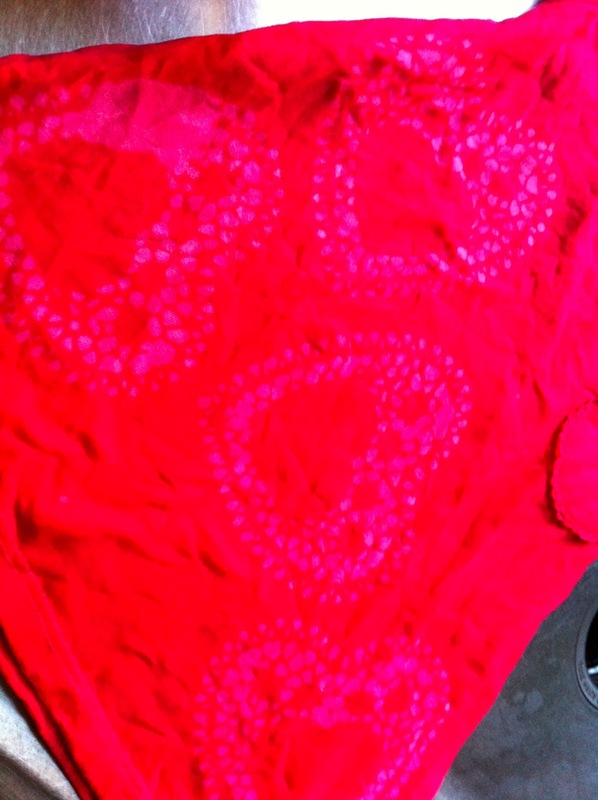 Then the other day I was starting to think about Valentines Day and remembered the doily heart printing we did last last year and wondered if they would work for bleach dyeing. 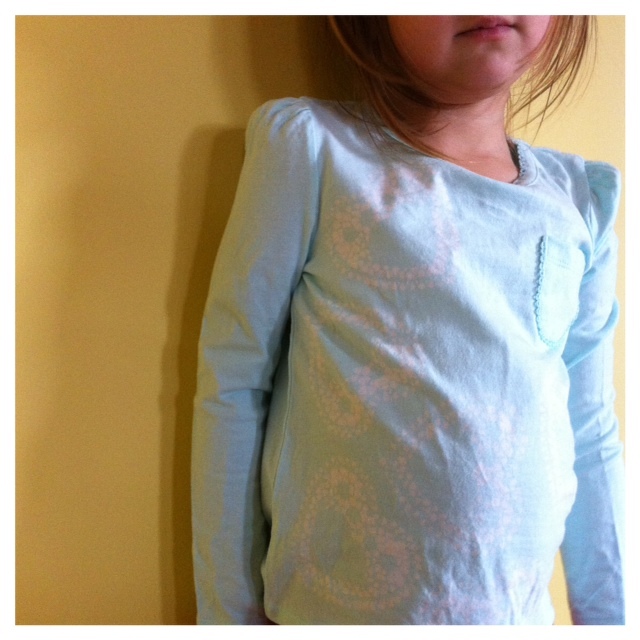 I was very excited to find out the doilies worked really well and that making these shirts was easy and fun to do. I started by buying two solid colored long sleeve t-shirts for the girls at Target. I then used a pack of heart shaped paper doilies (also from the $1 section at Target) and a bleach pen from the laundry aisle. I put a piece of cardboard in the shirt so the bleach wouldn't run to the back and then laid out the heart doilies onto the shirt to create a nice pattern. Next I drew over the holes in the doily with the bleach pen. As a side not remember to shake the bleach pen before using. 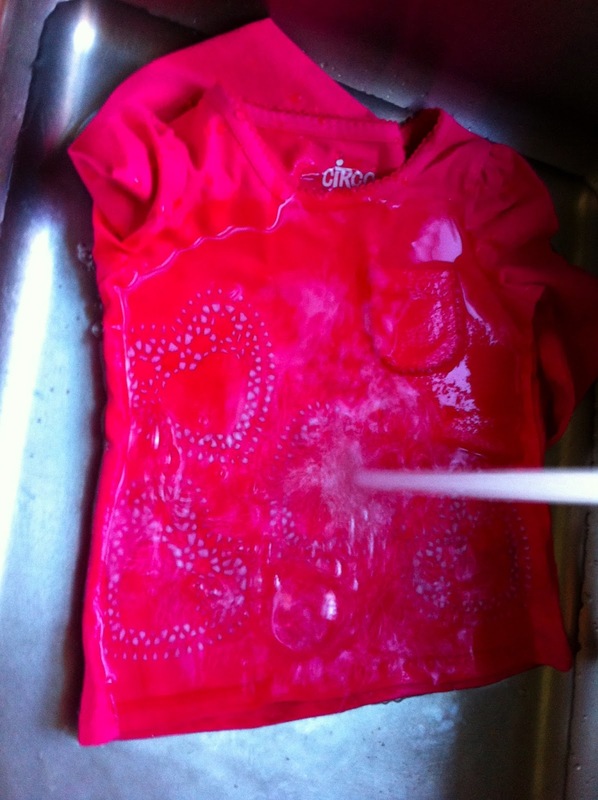 I didn't do this at first and it make the first bleach to come out very runny which left a little blotch on the shirt. I had to hold the doily down with my hand at first but once I covered the holes the bleach held the doily in place. It only took me a few minutes to go over all the doilies. I then let the bleach sit on the shirt for 10 minutes from the time I finished the last doily. After 10 minutes I carefully peeled up the paper, removed the cardboard and rinsed the shirt out under warm water in the sink. Once all the bleach was out it was ready for the wash. I made the first shirt for the Bean all by myself because I wasn't sure how the whole process was going to go. Once I saw how easy it was I got the Bee to help me make the one for her. She helped me decide on the layout of the doily pattern for her shirt and helped a little with the bleach pen before loosing interest. I definitely think under supervision this is a project that older kids could do on their own. For the Bee I bought a light blue shirt and while the dyeing worked great the pattern is light because the color of the shirt is light so I think the darker colors might be best. However both shirts turned out so well I am dying to make more so I guess I will just have to find a shirt for the Bee in a darker color so we can try again! Bleach dying can really bring the best of simple plain T-shirts. Thanks for sharing this fabulous work. wow,good job,I like DIY,and the t shirt.you are great. The making of printed T-shirts at home was very helpful to small businesses.if this is possible to make printed t shirts at home,then everybody make printed t shirts at their home. Beautiful !!! I like pink color.Thanks for sharing this.